Cooper Gallery is pleased to present the first major solo exhibition of Portuguese artist Hugo Canoilas in Scotland. Someone a long time ago, now. 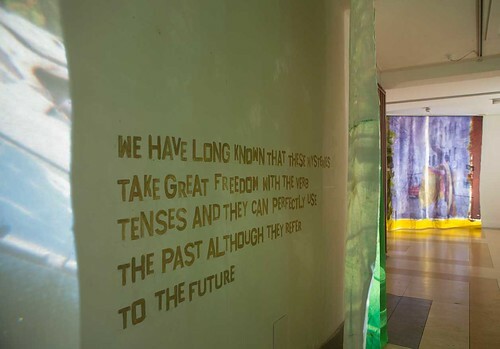 is a rich palette of visual and textual collisions between multiple collaged projections of paintings, photographs, drawings and writing, cast on each other and the architectural fabric of Cooper Gallery. Shown over two floors of the gallery the exhibition is a rare chance to engage in Canoilas’ complex visual mediation of images. Working in the light of popular aesthetics channelled through politics and ideas from philosophy and poetry, Canoilas’ practice intertwines itself with art history and the evolution of art during the first period of Modernism. Drawing upon the thought of 20th century philosophers and writers including Derrida, Heidegger and Fernando Pessoa, the art and painting of Hugo Canoilas maintains a nuanced dialogue between abstraction and social realism. By focusing on painting as a material and metaphor Canoilas has found an intimate and visually seductive way to register the ‘signals of the world’, and a powerful means to sensitize ourselves to this world. With Someone a long time ago, now. at Cooper Gallery, Canoilas’ draws upon the metaphors of the window and the mirror to set in motion an interplay of two forces, one passive and affirmative, the other active and rational. The culmination of this play is an invitation from Canoilas to comic book artist Francisco Sousa Lobo to create a comic book that mirrors and examines his own practice. Set out to be an exhibition within an exhibition, the comic book I Like Your Art Much acts as a reflexive voice and a point of departure from which the entire exhibition evolves to mirror the artist’s critical stance on the social and political histories of the contemporary. Doubling the psychedelic qualities of Jackson Pollock's paintings, this exhibition seeks "an intensity in the way people understand". Beautifully stated by Fernando Pessoa, this ‘understanding’ consists in acknowledging that "we are multitudes in ourselves and with a little self subtraction, or little anthropophagic appetite, can become whoever". Immersed in a multitude of reflected and projected images, the architectural spaces of Cooper Gallery resonate with fragments and echoes of paintings, drawings and photographs, transfixed and transposed onto each other. Juxtaposed with Canoilas' volatile use of text and newspaper cuts, the exhibition inscribes itself as a gesture of light, paint and graphite. Expanding the doubles and reflections embodied in Someone a long time ago, now., a final gesture underscoring Canoilas’ interest on the 'multitudes in ourselves' is a live performance by the artist. 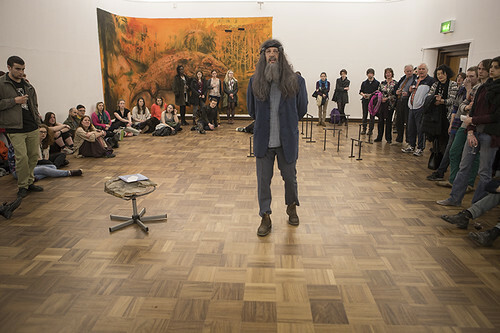 In the guise of his alter ego Jeffrey, a 60-year-old hippie, Canoilas "will not explain but boost the relation between the exhibited works and their relation to the whole (social, political and artistic events), believing that the relation between art and the whole (all things) is the real matter of art." Someone a long time ago, now., Hugo Canoilas. Cooper Gallery, 2015. Photos: Ross Fraser McLean. Someone a long time ago, now. Preview & Performance, Hugo Canoilas. Cooper Gallery, 2015. Photos: Ross Fraser McLean. Art in Scotland TV published this video about Hugo Canoilas' exhibition Someone a long time ago, now..
Hugo Canoilas is a Portuguese artist based in Vienna. Canoilas obtained his MA from Royal College of Art London in 2006, prior to this he studied at Caldas da Rainha in Portugal. Canoilas has received international recognition for his art work since 2005 and has been featured at major international spaces including the highly celebrated 30th Sao Paulo Biennial in 2012. Solo presentations of his work include A painting is getting its kicks, 1M3, Lausanne (2010), Endless Killing, curated by Chus Martinez at Huarte Contemporary Art Center, Spain (2008) and 10 reasons to be a member curated by Tobi Maier at the Franfurter Kunstverein (2007). Canoilas has also exhibited in international group exhibitions at major venues, most recently When elephants come marching in curated by Mark Kremer at De Appel, Amsterdam and Performance Proletarians organised by Lili Renaud Dewar and Benjamin Valenza at Magasin-CNAC, Grenoble and prior to this, exhibitions at Calouste Gulbenkian Museum, Lisbon, and the Institute for Contemporary Art, London among others. Canoilas has received widespread recognition for his work in major publications such as Art Review magazine, Guardian, Observer, Frieze, Metropolis M and FlashArt. Canoilas has been awarded major public art commissions in Portugal and has participated in a number of international residencies, most recently at IASPIS in Stockholm in 2013. As part of his art practice Canoilas has contributed to a number of publications including a recently published intervention in Art Review Magazine. Canoilas is represented by Workplace Gallery (Gateshead/London), Galeria Quadrado Azul (Porto/Lisbon), Gallery Nosbaum Reding (Luxembourg) and Galeria Collicaligreggi (Catania) . The Courier in Dundee featured two pieces on Canoilas' Someone a long time ago, now. including a preview by David Pollock in What's On published on Friday 28 March. Read Pollock's preview of the exhibition here. The galleries can be accessed via the east side of the DJCAD car park. Please note this exhibition is closed on Saturday, 4 April due to holiday building closures.